The above info came from Who Wants to Know?, and was edited by yours truly (contact me). The image came from Victor Ireland. Major Dastun is a long-standing and very proud member of the Paradigm City Military Police. He is proud to be a cop and proud to be protecting the city. That said, he's not like most members of the Paradigm bureaucracy. He's loyal to his position and to the city, not necessarily to the people in charge. 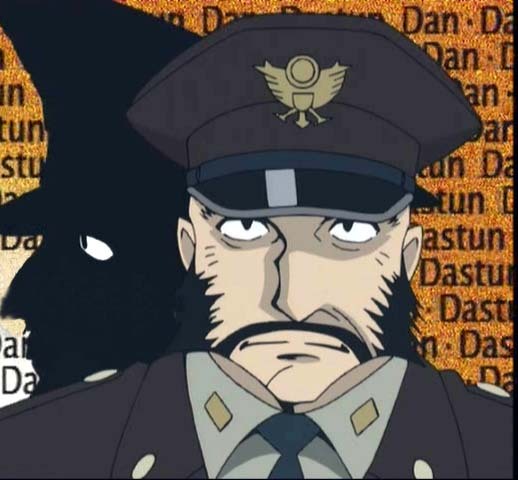 Roger used to work in the Military Police under Dastun until he quit. Dastun understands the reason Roger quit (he didn't like the corruption in the government) and agrees that Paradigm is not very clean, but he's sticking to his guns. His higher-ups may be dirty, but as long as he's a cop, he's going to stay on the force and represent the law in the city. Dastun was born some years before the Amnesia, so he did lose a few childhood memories to the event. Though the loss of those memories are not as wrenching as those lost by the elderly, he's not immune to the shock when a Memory stirs itself up from the past (as seen in episode 10). The above description came from Who Wants to Know?, and was edited by yours truly (contact me). The image came from Anime Adrenaline.